Sunday was a wonderful day. Waking after a nice long night's sleep (still sleeping on the couch, probably why I'm sleeping better - LOL - no snoring dwarf keeping me up) DH went out to get the newspaper, picking me up for breakfast and shopping at Target. The cloudy skies disappeared and the sun finally arrived just in time for us to rake and leaf blow the upper back yard. After a few hours of work it now looks tremendous (very happy). We then showered and went forth into the world. We have been looking for a new bar since the one near our home that we used to frequent closed more than a year ago. It's a tough call - but we decided to try Stout's yesterday afternoon. It actually wasn't too bad, we might consider going back there. They had Guinness on tap, so I was happy. After a couple of beers we visited one of our favorite stores that just moved to a new location. Holy Buckets! They more than doubled their space! They just opened for business on Wednesday at the new digs and it was a massive economic gamble for Bob and the crew, but I think they'll do well. They are obviously still getting things out onto the racks, but it's a nice space. 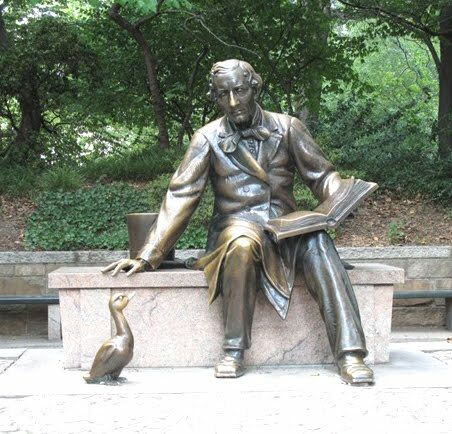 To top off the day, wish Hans Christian Andersen a happy birthday today. The author that so many of us know and revere for his wonderful fairy tales was actually a very prolific author. He wrote six novels, several travel books, thirty-five plays and one hundred and seventy-five fairy tales. His first novel was so successful that he began traveling, eventually spending almost twenty years abroad. He was of humble birth and always championed the common man. So...Happy Birthday Hans Christian Andersen. Current Location: Focused on finishing a story. I am easily distracted - I'm just sitting here going "Awww - cute duck..."
I'm all in favor of 'cute duck' - LOL.